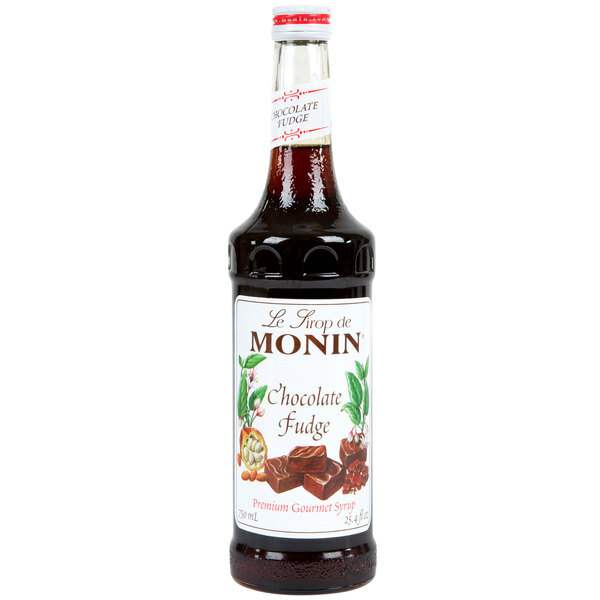 Containing quality ingredients, this Monin 750 mL premium chocolate fudge flavoring syrup is a quick and easy way to add new flavors to a variety of recipes! Add a splash of this chocolate fudge syrup to your most popular beverages and it's sure to please your guests. The rich, creamy taste and dark brown color of this flavoring syrup will enhance the sweet profile of your mixed or blended drinks without overpowering them or being too sweet. Plus, it's produced with pure cane sugar and no artificial flavors, making it an all-natural syrup with a balanced blend of flavor and aroma that will instantly upgrade your coffees, cocktails, and desserts. Since 1912, Monin has had a passion for delivering premium products that simplify the beverage-making process. Their sense of innovation and creativity has led to a wide variety of flavors and recipes to suit any menu. Use this Monin chocolate fudge syrup and craft superior beverages for your guests! Great product. This syrup gives a very authentic fidget chocolate flavor to any drink. This syrup would make a great add on to any drink that already uses chocolateflavrin suace. I just prefer chocolate powder to chocolate syrup, and that's the only reason for the 4*. I got it so I could add some chocolate to coco-colas and make "chocolate cola," and while it isn't perfect, it satisfies my cravings. The chocolate fudge syrup is rich and great for making our hot fudge lattes. The syrup is also a wonderful and pleasing addition to hot chocolate. This chocolate fudge flavoring taste just like it sounds. I don't think it is a dark or milk chocolate flavor, it is more of a fudge flavor. Just like the name. This is the greatest chocolate fudge flavoring syrup that I have ever tried and I am not kidding. It tastes amazing no matter what you use it for. I can not stop ordering this stuff. The premium chocolate fudge flavoring syrup is bold and really creamy. It is delicious when I add to our coffee or is great in our milkshakes. Anything that is chocolate fudge flavored is a must have in my house. We went through the entire bottle really quickly because of how good it was. The Monin premium chocolate fudge flavoring syrup is a very chocolatey tasting syrup great for adding to malts for a richer taste. The syrup is really thick and strong so a little does it. This chocolate syrup is VEGAN! We purchased it for our vegan coffee parlor to use in mochas, and it has a great smell and taste. We are very happy with it. This syrup is the perfect addition to any coffee or espresso! Our customers love it, and so do we! The pump makes adding it to beverages quick and easy! It makes the perfect mocha lattes! Chocolate fudge sauce makes ice cream and shakes even tastier and this chocolate fudge syrup also does. It adds the flavor without the added thickness when such is desired. I am a New Englander stuck in the South, and I have been missing Polar sodas so badly. My favorite is their diet chocolate fudge, and I couldn't find anything like it around... until now. I bought this syrup to use with my soda system, and my first sip immediately sent me back to memories of home. If you love chocolate sodas or tootsie rolls, then you will love this syrup. If you want a true chocolate flavor, this might not be the one for you. I highly recommend you buy some vanilla syrup, and use a 1:5 ratio with this syrup: it's heavenly.